From New York to London to Tokyo, fans of the online Cambridge Dictionary have been voting for the word that they believe best sums up the year 2018. Our editors chose a shortlist of four words from this year’s new additions by looking at which ones were most popular and most relevant to 2018, and then asked you – our blog readers and social media followers – to vote. The Cambridge Dictionary is one of the most popular online dictionaries in the world, and you, our users, are part of a very smart and enthusiastic global community using our free resources. So we were eager to give you the opportunity to tell us which words out of the thousands of new words and definitions we add every year best reflected 2018’s trends and events. Of course nomophobia isn’t a scientific word; a true phobia (extreme fear of something) is different from anxiety (extreme worry). The word has actually been around a lot longer than you would think. The earliest known use was in 2008 – not by psychologists, but by YouGov researchers, in a report commissioned by the UK Post Office. It then began to appear in UK media and has since spread around the world. Having proved its staying power, it was added to the online Cambridge Dictionary earlier this year. For more information about how the Cambridge Dictionary editors decide which new words to add to the online dictionary, take a look at the two-minute animation on our YouTube channel. Of course ! Nomophobia ! I don’t like that word ! Nomophobia is a terrifying notion, and I’m not proud to admit that’s a real part of my world. Clearly though, I am not alone in that! Seems like we have a lot more new words. I really like it. It is fantabulous. etymology, please. Phobia I know, but :nom: usually has ought to do with names, does it not? Gender gap, ecocide, and no-platforming are way bigger problems than our obsession with phones. Sooo disappointed that THIS is our word of the year. 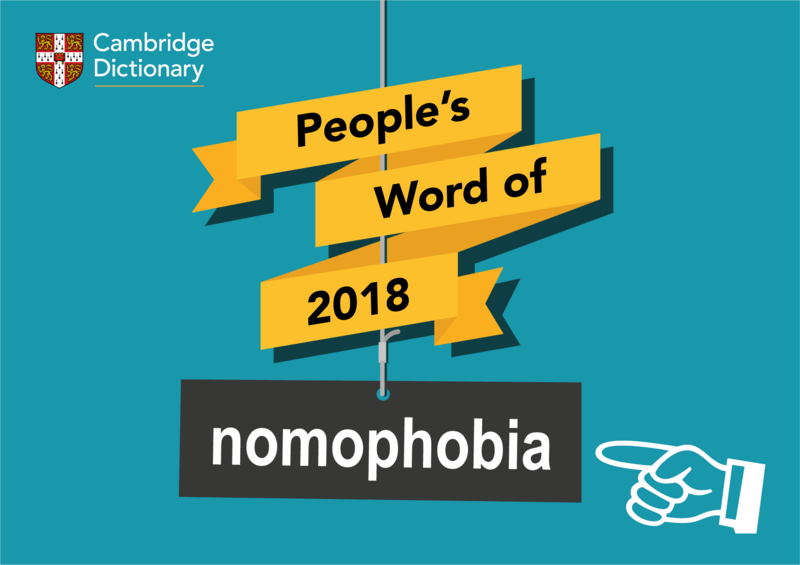 By selecting nomophobia as our word of the year, we are symbolizing that we think that unequality, the destruction of our environment, and the oppression of someone’s voice is less important than fixing our obsession with phones. I’m not saying that this is everyone, but it is enough people. We NEED to fix this!!! This is pathetic and sad. Nomophobia is actually a perfect made-up word to describe snowflakes that Meltdown if they can’t be on their phones 24/7. Support me by send me vocabulary mail….